Left to right: Suzanne Wood, Ability NB Director of Development; George Woodworth, Ability NB Board member and Chef Brent Conlin, Crowne Plaza Fredericton Lord Beaverbook. Crowne Plaza Fredericton Lord Beaverbrook – Our Caring Corporate Partner Award is awarded annually to a business that has made outstanding financial and/or in-kind, including volunteer, contributions to our organization. 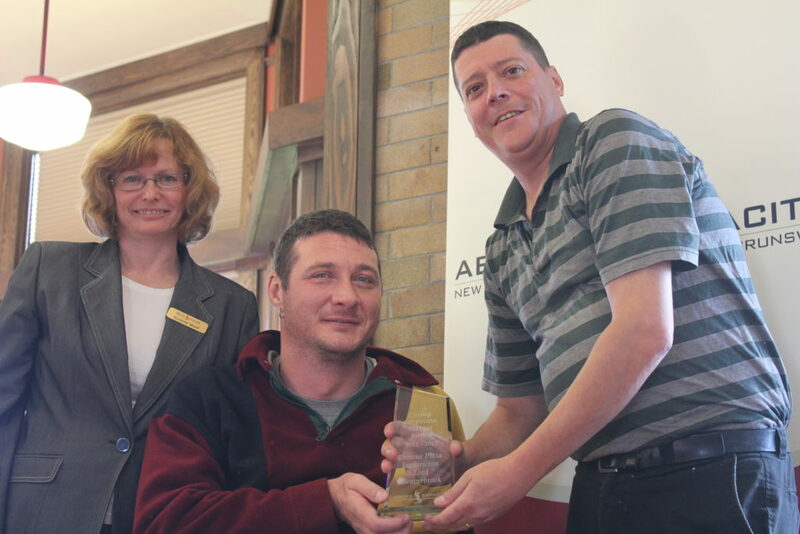 The recipient of the 2011-2012 award is the Crowne Plaza Fredericton Lord Beaverbrook. The Crowne Plaza Fredericton is a true caring corporate partner. They have provided over $5,000 in in-kind banquet services to Feast in the Field since our re-launch of the event in Officer’s Square in 2011, helping us to raise close to $40,000 each year. Chef Brent Conlin has been a key member of the event organizing committee and in 2012 he donated a personal cooking lesson as a prize for our Feast cook-off contest. Brent and the Crowne Plaza Fredericton also continuously promoted Feast in the Field and Ability NB on social media leading up to the event. The Crowne Plaza Fredericton Lord Beaverbrook team including Walter Lauffer, General Manager; Executive Chef Brent Conlin; Cyndy Jewett, Meetings Director, and all the banquet staff who have assisted us on event day have been enthusiastic and incredible partners. We were pleased to present the Crowne Plaza Fredericton Lord Beaverbrook with this Caring Corporate Partner Award.